With IBM® Connections Docs, you can work with various document file formats. 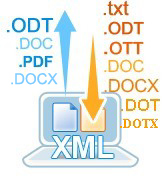 Files opened from one format can be exported to other formats. If you create, edit, and publish a Microsoft Word file in Connections Docs, the file is stored in Word format. For example, if you edit a .docx file in Connections Docs and publish a version, the file is saved back to the .docx format, which you can then download directly.